I hadn’t really thought about Sir Patrick Stewart since I missed the opportunity to see him in February 2012 when he performed in London on my birthday. But that all changed 27 April when I thought a former co-worker of mine still had my copy of Sir Patrick Stewart’s Macbeth. Then a whirlwind of things that brought him to my mind happened. 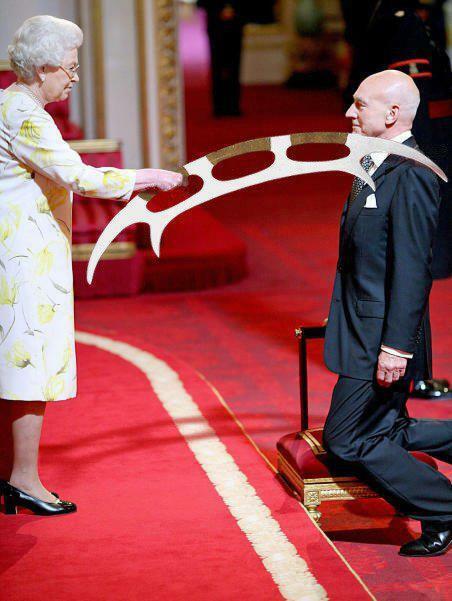 On 2 May I saw Photoshoped image of the Queen of England knighting Patrick Stewart with a bat’leth instead of a sword on someone’s Facebook and reposted it because it was too hilarious to see the queen with a Klingon weapon. 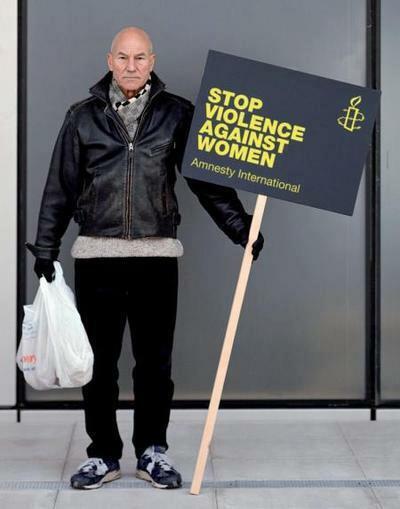 That evening my cousin posted an image on my Facebook wall of Sir Patrick Stewart holding a picket sign on behalf of abused women. On 3 May, I posted a response to my cousin that included the link to Sir Patrick Stewart’s video for Amnesty International. 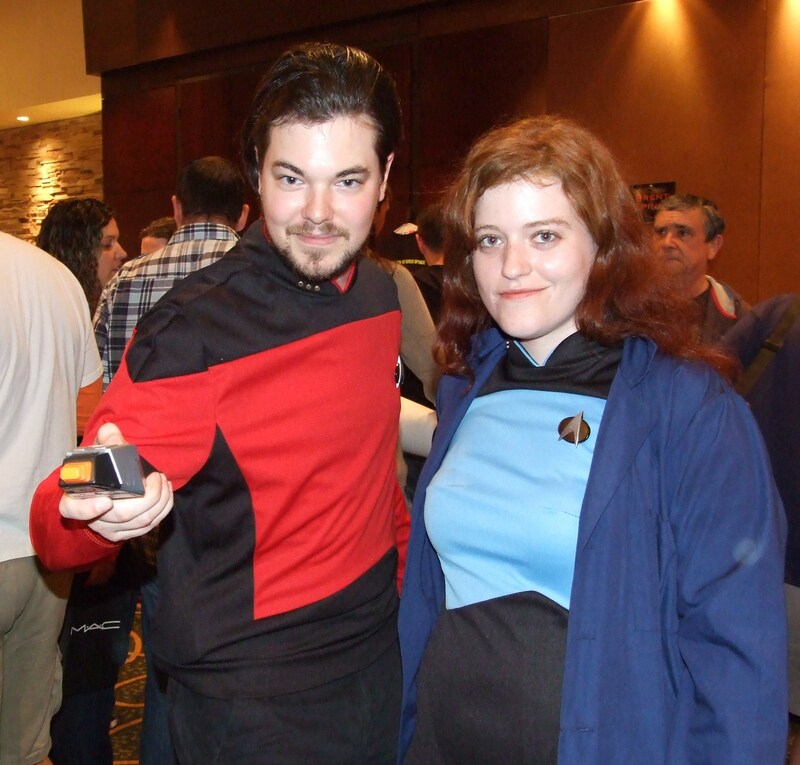 That evening while checking my Twitter list, I saw a post from Jonathan Frakes (who played Commander William T. Riker in Star Trek: The Next Generation). 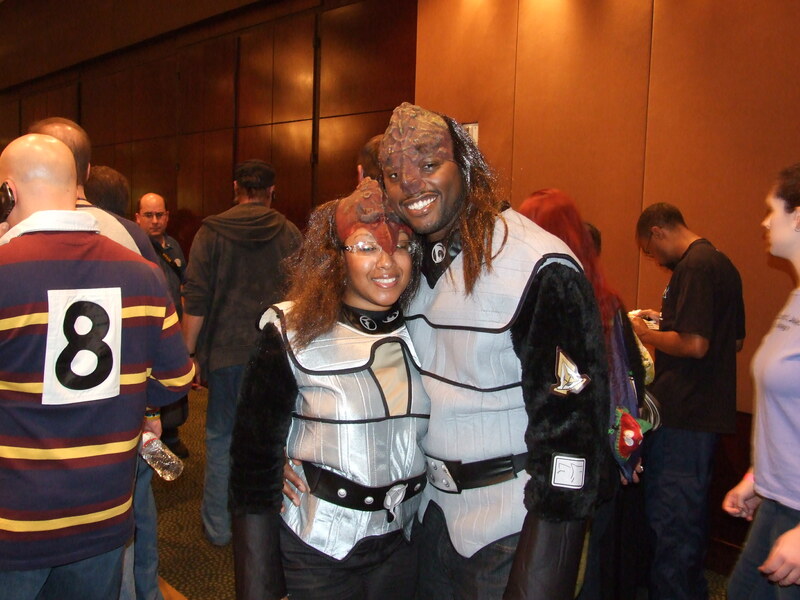 It was as follows: “#creationcon Cherry Hill NJ. Incoming– @levarburton @BrentSpiner & Sir Patrick Stewart…RED ALERT!” Needless to say, I was floored. I looked up the info online and found out that he would be 20 minutes from my home on Saturday, 5 May. I had less than 48 hours to figure out how I could make it to the convention even though I knew I had no extra cash. “I want to be this girl,” I said as I entered the office. “I want to be able to play opposite him.” So I started to work harder on being an even better actor. Now in 2012 here I was again at another crux in my acting career. After returning from Slovakia, I decided to seek out theatre work in the US again. It has not been easy. Most shows in my area are unfortunately being cast “traditionally”…in other words, it’s hard to find a good role for a black woman when the only roles available are in all-black shows or as non-speaking chorus members. Being that Patrick Stewart had to struggle with his own appearance in this profession, I often try to remember how he pushed on regardless of his early baldness. He didn’t give up. So the chance to see him and listen to any pearls of wisdom that could come from him was an opportunity I didn’t want to let pass by me. 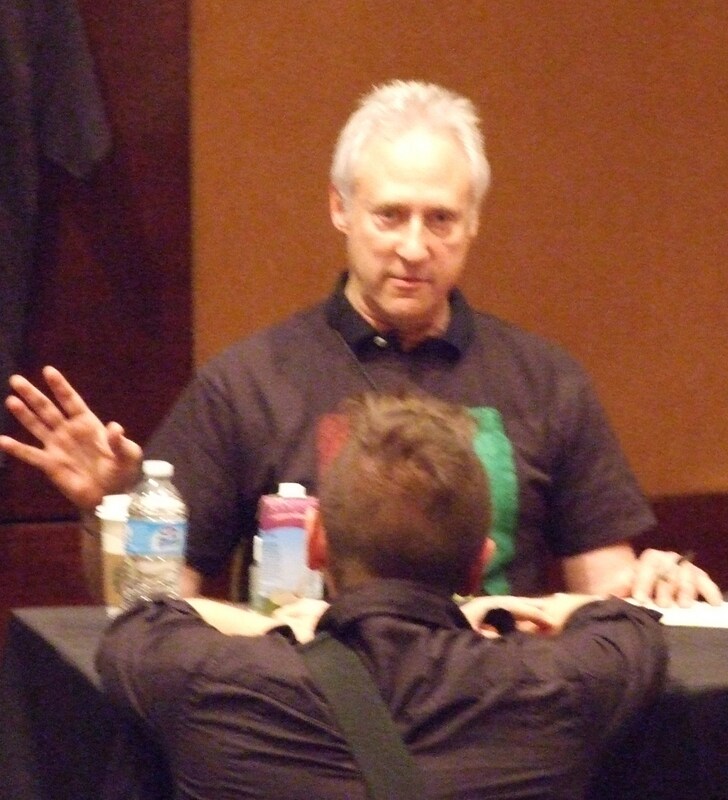 As far as I knew this was the first time, he had ever been to NJ for an event (which he verified at the convention). Needless to say, I was beyond thankful when my older sister gave me some extra cash for watching her children Friday night, less than 24 hours before he was scheduled to speak. “What!? !” she yelled into the phone. 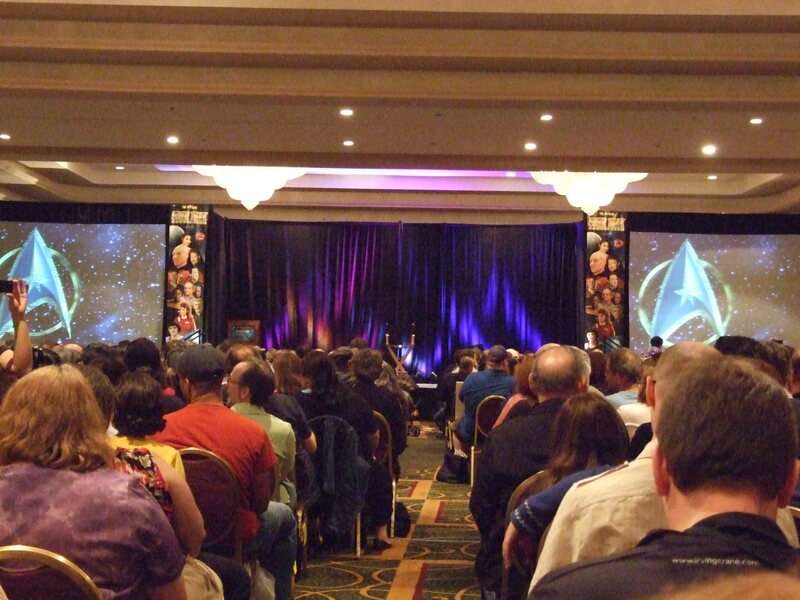 “Well, there’s a crowd and a sign that says Levar Burton. Hold on let me check.” I tried to get closer. Sure enough Levar Burton was at a table. Though I loved Reading Rainbow, will always be proud of his work on Roots, and can say we share the same birthday, I was not there for him. “Wait! 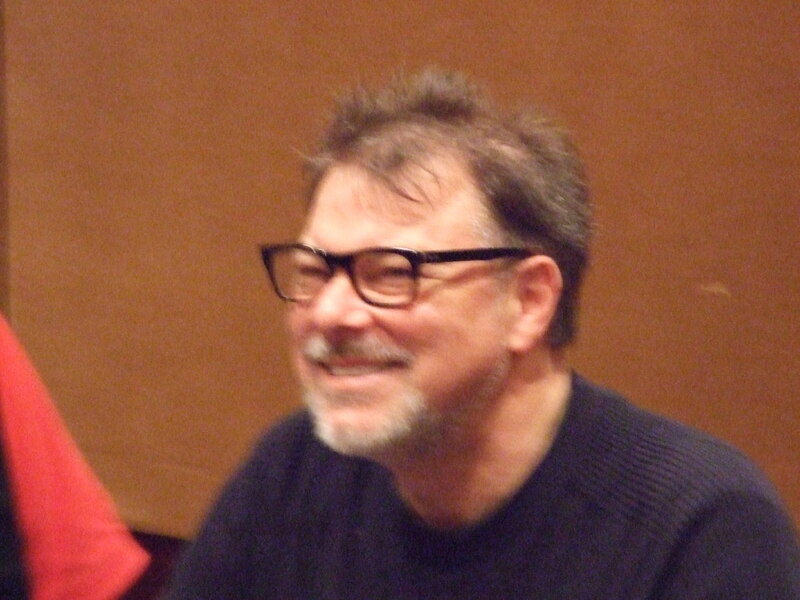 There’s Jonathan Frakes!” I’ll admit that was kind of cool because he was the one that had drawn my interest to the show, but it was kind of sad to see how the years have not been as kind to his dashing looks. Though he still had a charming smile, twinkling eyes, and the soothingly smooth voice of Xanatos (one of my favorite characters from Disney’s Gargoyles). “Then get off the phone and take a picture for me.” She said before hanging up. I will say I tried to get a good picture before and after Sir Patrick Stewart spoke but it was difficult with the crowd and the restriction about flash in a poorly lit area. When I finally got a clear shot right before I left, I think I pissed him off. Sorry, Mr. Spiner, but there are certain things I will do to bring a smile to my sister’s face. BTW, I still love your CD and your work in ST:TNG, Independence Day, and Dorothy Dandridge (though I won’t discuss Ms. Barry’s performance). I eventually got into the main hall, found a seat with the help of other attendees and waited with bated breath through the end of an auction. My seat was on the center aisle but it was a little more than half way back. 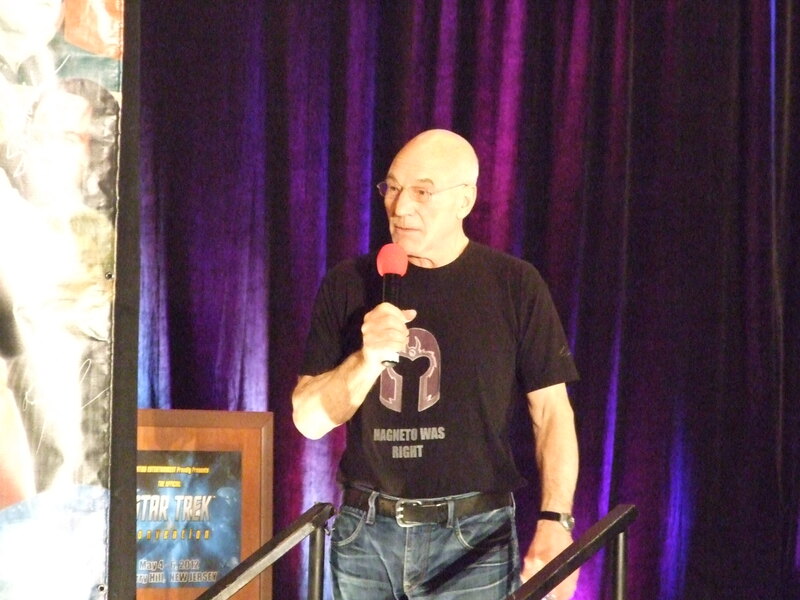 From the moment Sir Patrick came on stage, he was delightful humorous yet gracefully poised. He’s truly a man who knows how to work his stage presence. Below, I’ve attached two video clips I found online. I don’t know how long these videos will be allowed on YouTube, but here are some clips from Sir Patrick Stewart talk back. This is from his opening. The weekend before found the whole original cast of Star Trek: The Next Generation celebrating there 25th anniversary at a huge convention in Calgary, Canada. 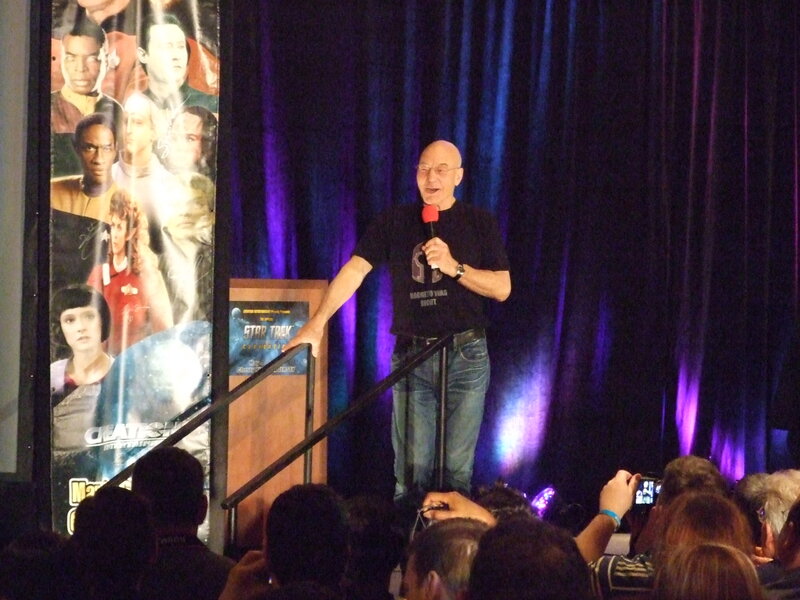 Sir Patrick talks about traveling from Canada to California to Philadelphia. He took off his jacket and showed us a shirt someone made for him. It said “Magneto was right.” (for all you X-Men fans). Then he joked about how comfortable the shirt was but said that was not a request for anyone to come up and touch it, we would just have to take his word on it. For the past eight years, he’s been doing theatre in London and occasionally in the US because he wanted to get back to his theatre roots. He said that at first it didn’t seem to work. He first show back in London wasn’t that successful, but he didn’t give up. He did another show, and it was highly successful. Now that he’s back in the US he will go back to working on film and TV, but he’s planning to do a show on Broadway in September 2013. The rest of his time was spent doing a Q&A. At first I sat and listened to some of the questions and his responses. I learned that the British no longer refer to him as Mr. Stewart, he is either Sir Patrick Stewart or Sir Patrick but never Sir Stewart. He said it’s a British thing that will never make sense to Americans. There were a few questions that proved how little people knew about Sir Patrick. For instance, there was a person who asked him out of the two roles he played, Captain Jean-Luc Picard and “that Scrooge from I think it’s A Christmas Carol“, did he enjoy playing the most. I wanted to scream. First off, he did a one man show of A Christmas Carol which meant he played ever character and narrated the story. (I have the CD version and it’s amazing!) 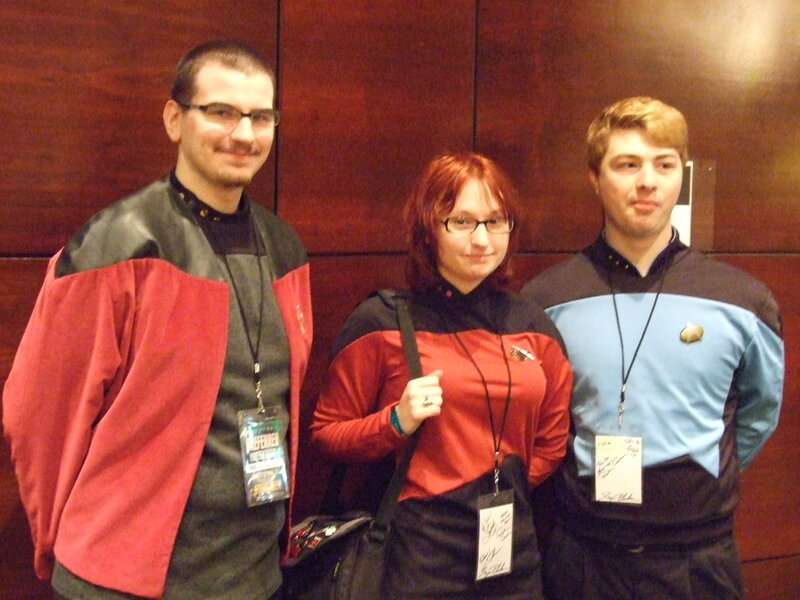 Secondly, the guy obviously didn’t know that Sir Patrick had been acting long before Star Trek and long after. Sir Patrick handled it beautifully, “Well, you’re only asking me about two out of over 200 roles.” Then he went on to say that it’s hard to pick a favorite because whatever he currently is working on is his favorite. Since he’s not in anything now, he’s being the role of Sir Patrick Stewart and he’s enjoying that more than any other role. Then this person came up. I should have expected the person who asked this question to be the one to break the “rules” and video tape. Honestly, I was surprised that a person would ask the question this man asked. Anyone who knew anything about Sir Patrick knew that his baldness had been an issue for him since he lost his hair at the young age 19. He has said time and again in interviews how much he thought his life was over before it really began all because he was bald so early. Yet, this man from the audience asks what I consider a rude question, but you have to listen to how beautifully Sir Patrick handles it. The man is definitely gracious and eloquent with a calm demeanor even in situations that make him uncomfortable. Meanwhile the questions continued. Each one was answered beautifully even if they weren’t the brightest of questions. He took compliments with humble grace, refused to let a woman have his water bottle by joking that he’ll auction it off himself in a campaign to “Save Patrick Stewart from Himself”. 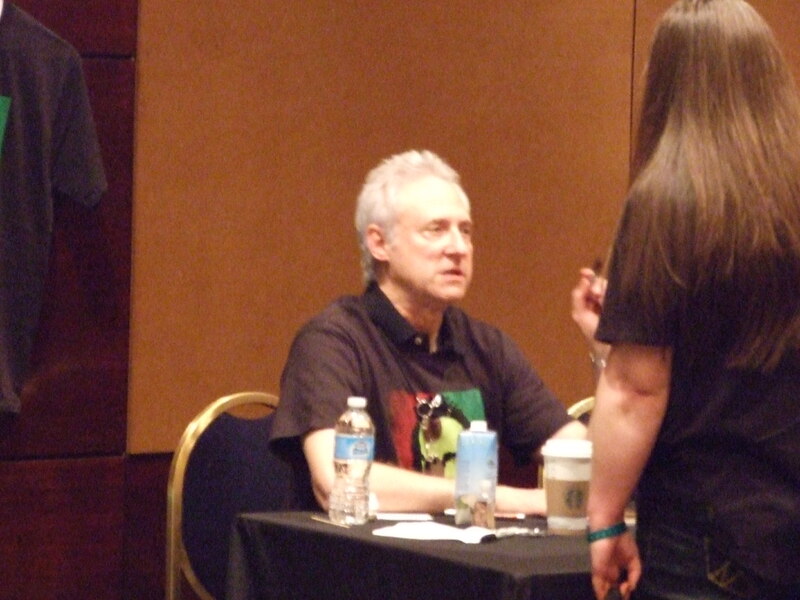 He laughed loudly when someone mentioned how William Shatner is Canadian. What all was going on in his mind no one will know, but it was hilarious to him. He went on to say that both of them had backgrounds in classical theatre. Then he chuckled to himself again. Personally, I find it funny because I think Sir Patrick is on the level as an actor that William Shatner will never attain no matter how many times he resurrects Captain Kirk in books. 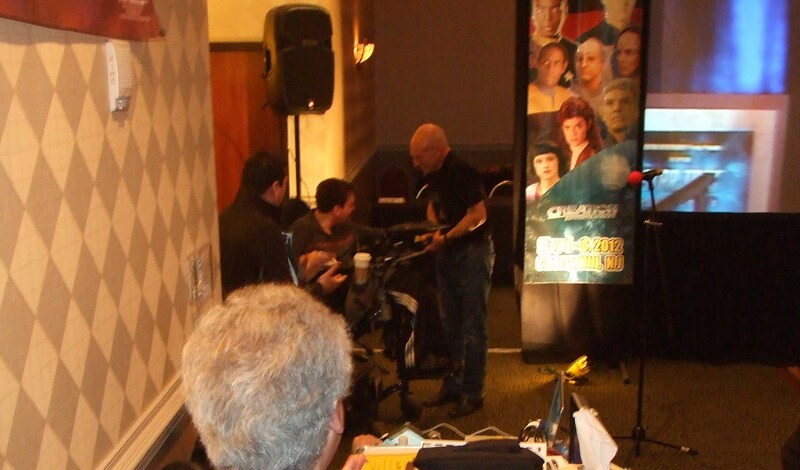 Anyway, there was a touching moment when a man in a powered wheelchair typed out his question for Sir Patrick. The question was answered and Sir Patrick asked the man if he had another question, then waited patiently for several moments as the man tried to type. His reply was to thank Sir Patrick for being there and to wish him continued success for many years. 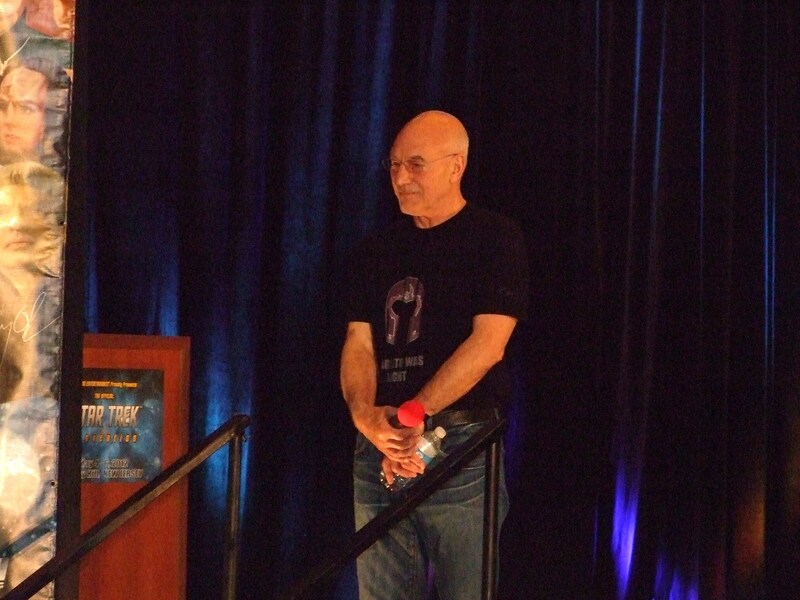 To this Sir Patrick thanked the man, then came off the stage and greeted the man himself. 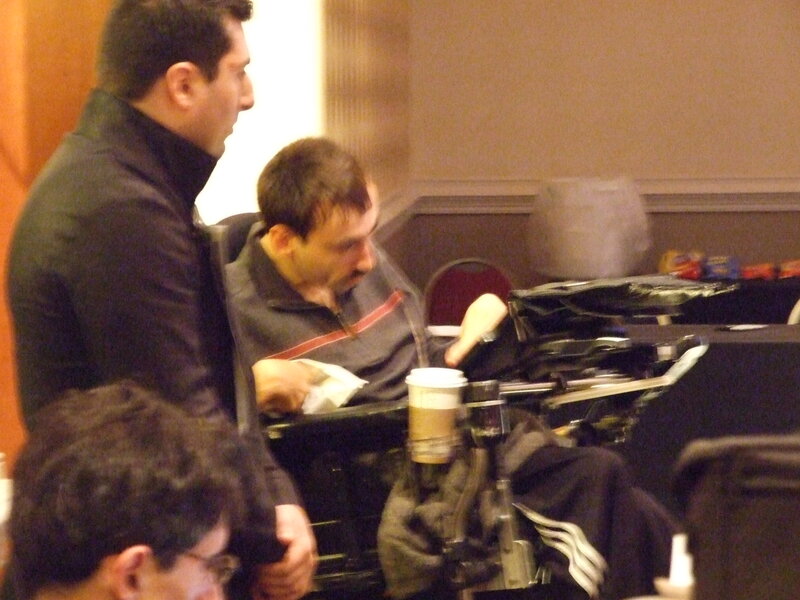 I had tears in my eyes as I watched him speak quietly to the man in the wheelchair. On my side of the auditorium there was only one person left before my turn when the hosts of the event to Sir Patrick that he had to wrap things up and head off to the autograph area. I couldn’t believe how close I was. For a brief moment I was upset, but he looked right at me and my Macbeth shirt before he looked at the rest of the two lines and apologized that he had to end things. 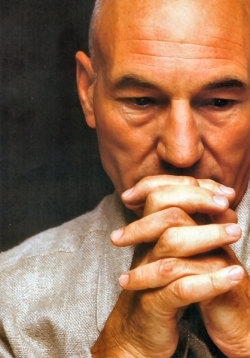 I was a step closer to Sir Patrick Stewart, so how could I ever stay upset. A week before I would have never thought I would have ever gotten that close. Hopefully, the next time I see him, I’ll have the chance to speak or work with him. I was going to ask him for some advice for an actor who wants to get to a level where she (I) could perform with him on stage. Though I didn’t get to ask, I gleamed from the stories he shared and the lessons he learned. 1. Be consistent- When he started, he would work at a theatre for more than one or two shows. He work with them for years. Once he made it to the Royal Theatre Company, He stayed with them for over 18 years. 2. Push through your self-appointed issues. He didn’t let his baldness stop him from auditioning or performing. 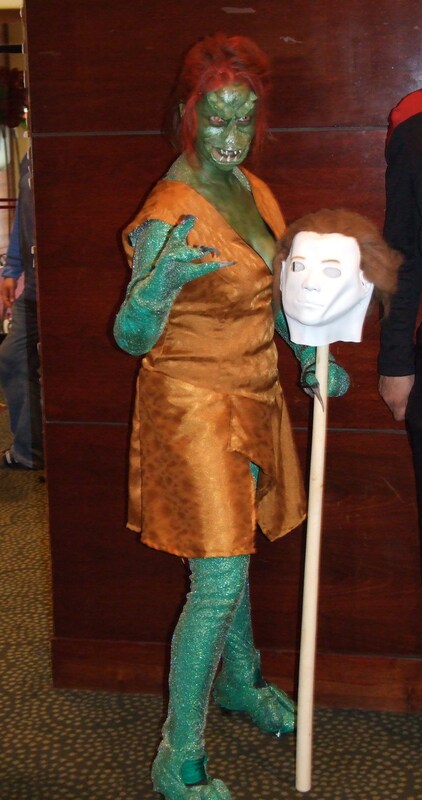 He did some pieces with wigs and some without them. 3. Be determined and hard-working. You can’t give up. You have to keep getting out there. 4. Remember to have fun. The cast of ST:TNG taught him that. He said before them he never thought about goofing around when it came to work. Everything had to be serious. Yet he saw how they worked hard but also had fun. Sir Patrick said that was one show that he did and there was a lot of laughter on the set. He will always hold those memories. So though I didn’t get to speak with him, I learned a great deal. I hope it inspired more than me that day. 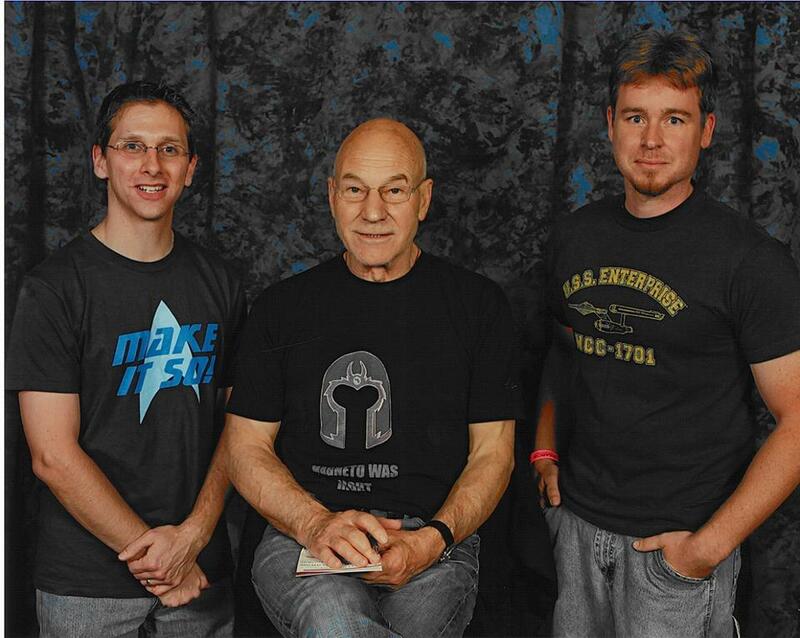 This entry was posted on Thursday, May 10th, 2012 at 02:53	and tagged with Cherry Hill, Creation Convention, Inspiration, Patrick Stewart, Shakespeare, Star Trek, Star Trek: The Next Generation, theatre and posted in Film & TV, Theatre & Opera. You can follow any responses to this entry through the RSS 2.0 feed.